SewWonderful: BIG B, little b: What begins with B? BIG B, little b: What begins with B? 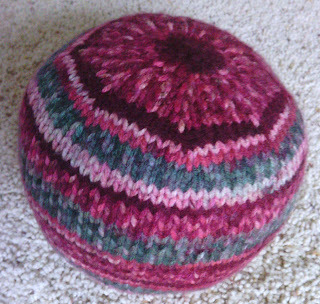 With fond memories of a crocheted ball a neighbor made my children when we lived in NE Portland in the '70s, I went looking for a pattern to knit a ball for my youngest grandson. My search took me to Judy O'Brien's free pattern. Her pattern is for sock yarn but with a couple of modifications, I thought it might work in this lovely self striping worsted that is virtually fuzz free. After making the first ball, my own pattern emerged so I am offering it for you all to try. Using Emily Ocker’s cast on: CO 4 stitches and divide evenly onto 2 circular needles, leaving an 8 inch tail. All even rounds are knit. Use a stitch marker to designate beginning of round. Rnd 22: Place a stationary marker at the beginning of round and knit even for about 26 rounds. Decrease to close ball. All even rounds are knit until round 18. Rnd 13: K2, K2tog around (24 sts) Start stuffing ball with fiberfill. Rnd 15: K1, K2tog around (16 sts) Continue stuffing ball. Rnd 17: K2tog around (8 sts) Make sure ball is firmly filled with fiberfill. Cut yarn, leaving an 8 inch tail. Run yarn through the loops with a tapestry needle and remove knitting needles. Pull yarn tight and run through loops again to fasten off. Hide end inside ball. *I Love this Yarn! from HobbyLobby or Deborah Norville Everyday Soft Worsted are good easy care choices for this project. One day I need to give this a try!